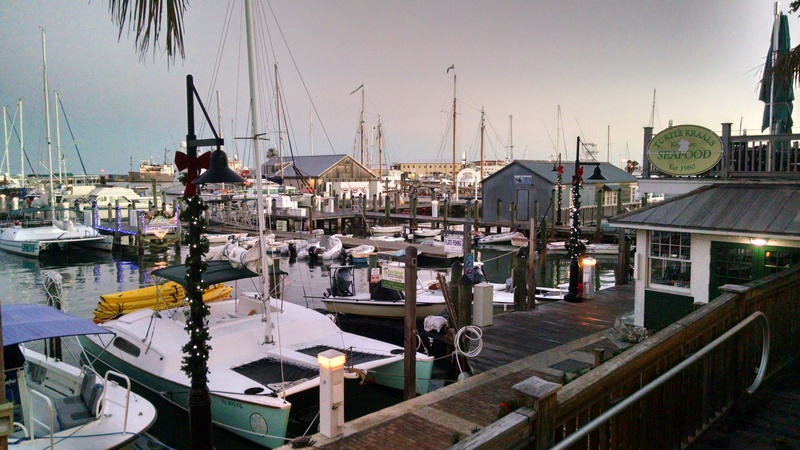 Valinor Travels | chesapeaketidings & more..
Well, the US Sailboat Show in Annapolis has come and gone. We had five days of variable weather, with frequent showers, some fog and occasional sun. 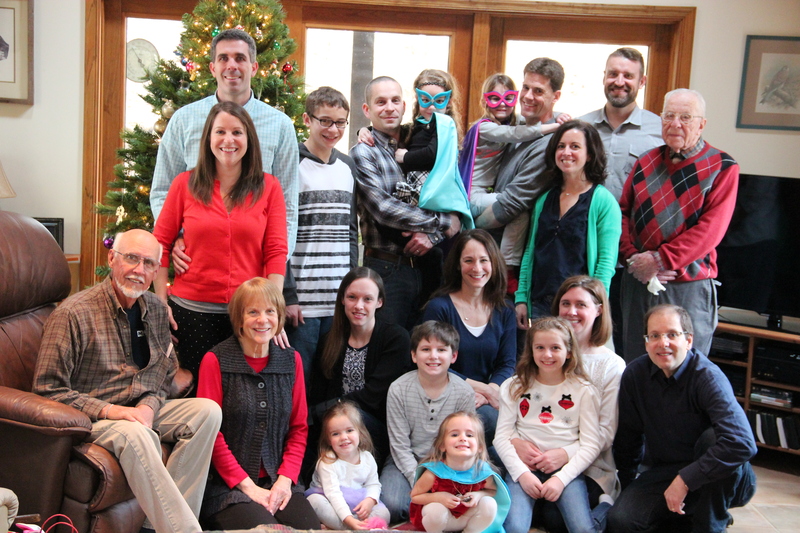 We also had lots of folks. All the boat displays were busy, including our Passport Yachts. And in the mix were some serious buyers! Here are a few images from/of the Show …. 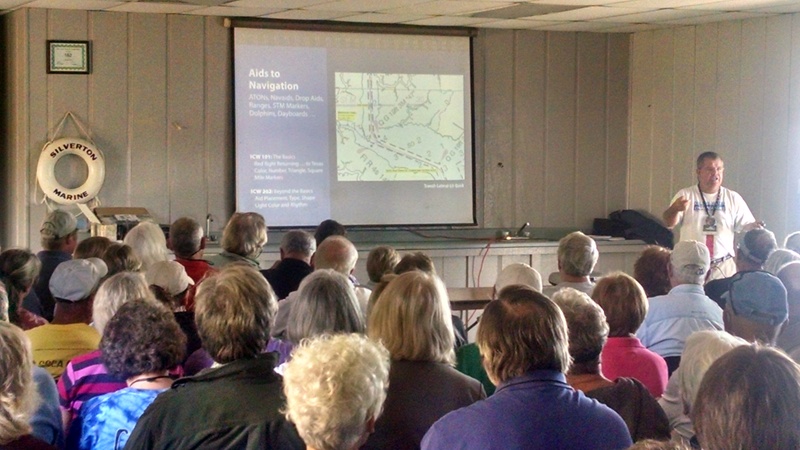 In addition to all the boats, there were great seminars by ICW experts like Mark & Diana Doyle (On the Water Chart Guides) and Wally Moran of Sail magazine. As important were the social opportunities to get together and meet fellow sailors we may only know from on-line forums. All-in-all a great few days! All the signs are here. There’s color in the trees – besides green. Large flocks of birds are wheeling with intent to move. Skeins of geese are lining south. Skies are beginning to take on that slate grey, and mornings are not as warm despite the sun whose angle is lessening. And, cruisers are gathering here in the Chesapeake to stage their annual trek southward. Local anchorages are filling up with home port names from as far away as Canada. The annual Seven Seas Cruising Association GAM is just behind, and the Annapolis Boat Show just ahead. For those preparing to head south in search of warmer climes it is a busy and exciting time. For those who are not, it’s time to prepare boats for the coming cold. Having tasted that southbound experience, it’s a sad time to watch others leave. Since the great time at friends’ wedding (last post). Valinor competed in the Hospice Cup regatta. A very light wind day. 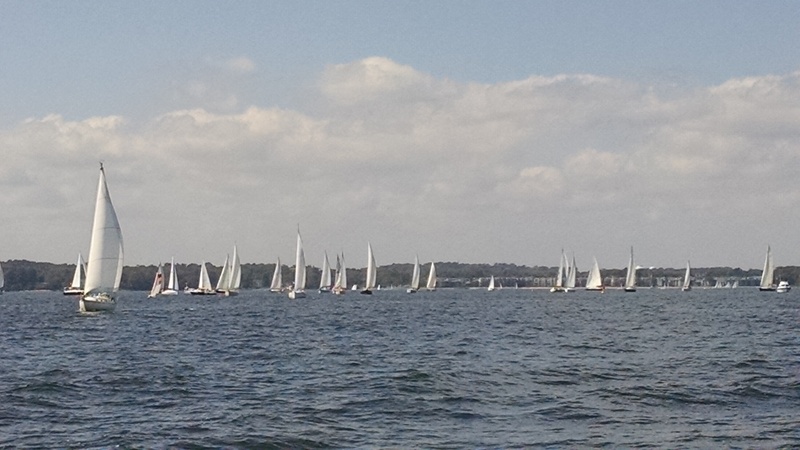 Lots of boats in several classes – our Hospice class had nearly fifty. It was a great start and the first couple legs went well then the winds died and the tide changed which brought an opposing current. OK, so we didn’t finish in the time limit……..but we still had a good time, and for a great cause. 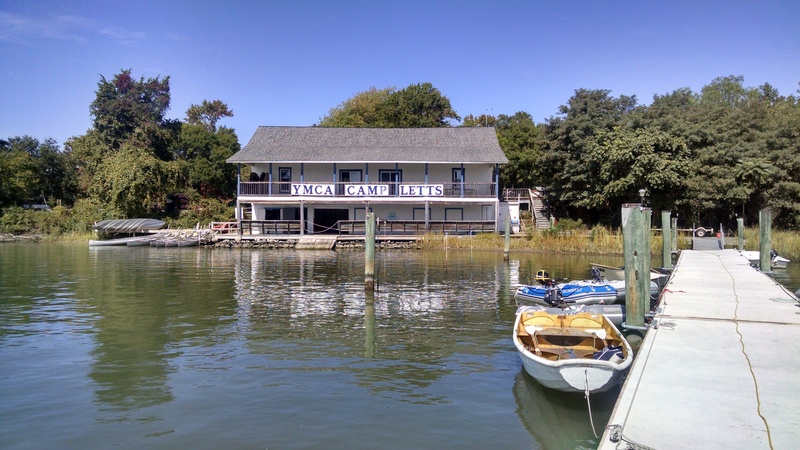 The next week was the SSCA GAM at Camp Letts on the Rhode River. 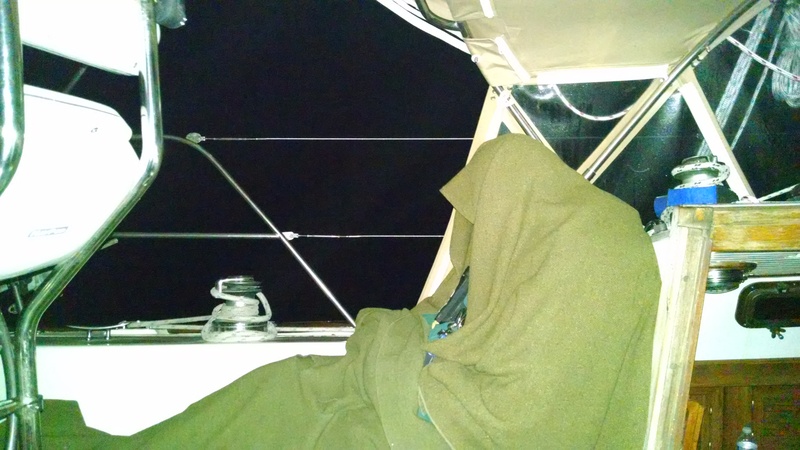 The plan was to sail down early (to get a good anchoring spot, and enjoy the water time). The weather know what we intend to do, and takes great glee, I’m sure, in messing with our plans. 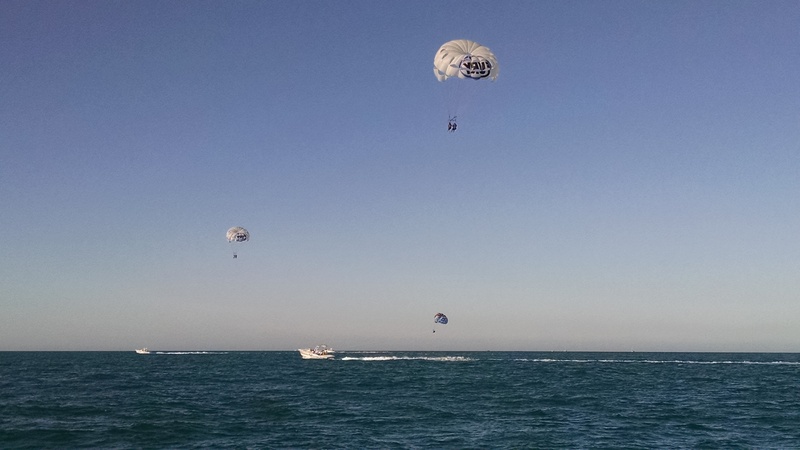 Those two early days saw 20-30kts of wind and 3-4ft short chop on the Bay – even worse in the southern Bay. Fortunately all settled down by the Friday start of the GAM, and it was a nice sail for the 12nm or so down from my Eastport slip. Evening in the anchorage was worth the trip in itself….. The GAM saw record attendance with over 200 cruisers and about 4 dozen boats. 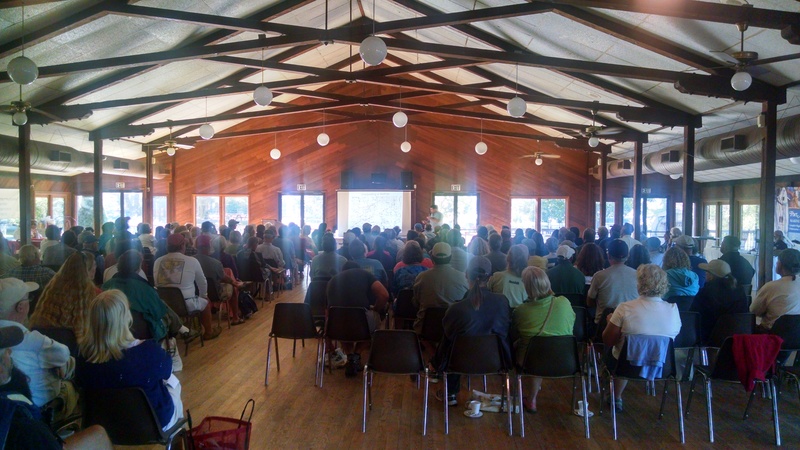 Lots of good information was shared and the seminars were great. It was fun to visit with folks you may only see once a year here, but follow their blogs to share their travels and experiences around the world. It is often great entertainment to watch fellow boaters in anchorages as they maneuver in and out. So it was that I watched three boats find the shoal in front of the Letts boat house – helped pull one off. 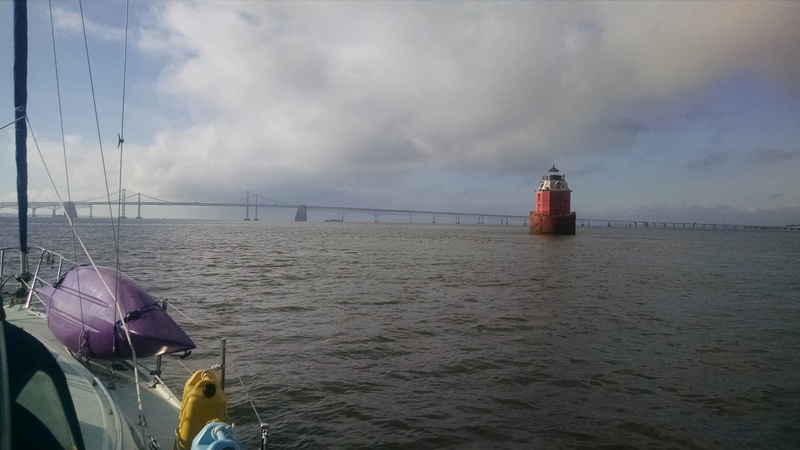 Also hailed a large power boat that he had a line overboard – just as he came to a stop with the anchor rode wrapped on his prop….lent a hand there too to untangle. It was a beautiful day and all outcomes were successful. Next morning, it was my turn to head out. Again, weather forced a change of plans. I intended to spend the week sailing wherever the wind pushed me — what wind? The Bay went calm, and the forecast was for that to last most of the week. I made a motor run to north of the Bay bridge to a cove off the Magothy River where I found a quiet anchorage with only a couple other boats. 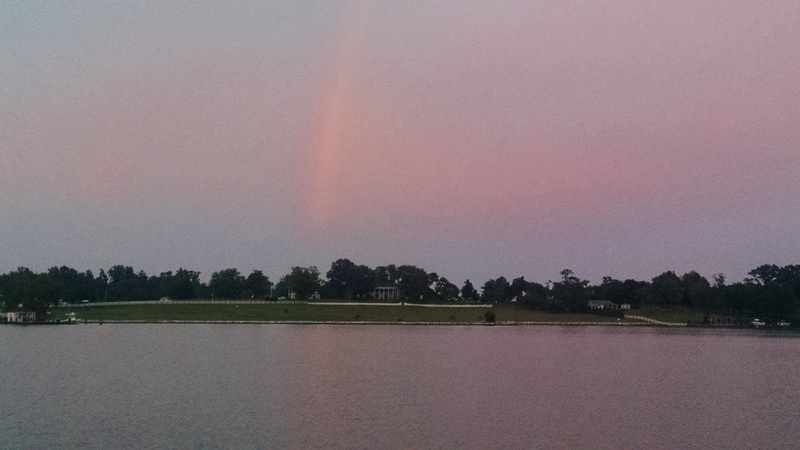 After settling in, a light rain found us but left a beautiful rainbow as it cleared. So, all-in-all a good day and pleasant evening. Next morning I made an early departure for home slip and began working on the boat ‘to do’ list in preparation for a club cruise in just a few days. More on that annual chili cruise next time…….. Sometime in July I passed the 100 days on the water mark, which included the 48 days it took to come back up the ICW from Key West. 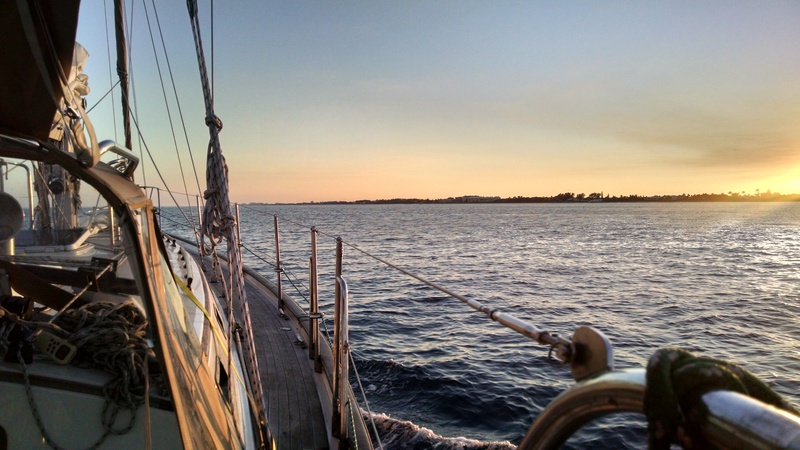 But still, a lot of good time in the Bay this Summer – and sailing season isn’t over just yet! Stopped at Pirates Cove and a Singles on Sailboats gathering in April on the way home, then a cruise in May to the MD DNR camp in the Wye River. Had a fun weekend with a grandson who’s learning the ropes pretty quick…. Then there was the sail with friends in the Annapolis Sailors’ Club to St Michaels, and a treat to see the rigging of the log canoes..
Lots of sailing in between, but just this past weekend it was great to combine a sail to the Choptank for a wedding of two good friends – and what a great two-day party! ….including the roast pig! That’s the one on the left…..the other one is Mike the super chef! 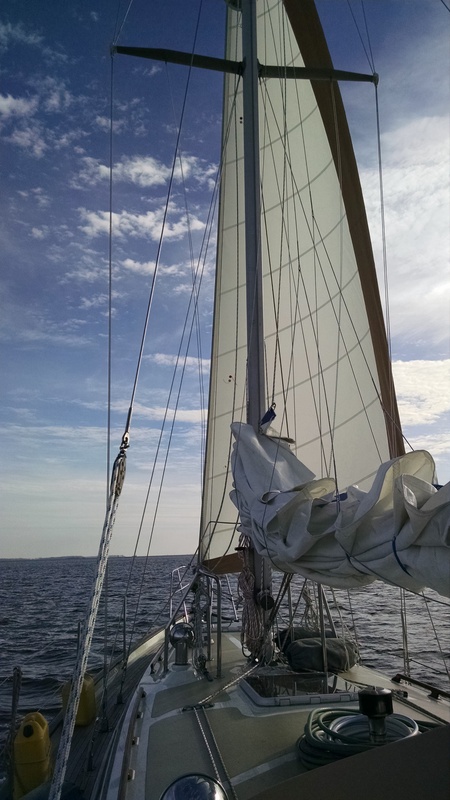 Still plenty more sailing before winter sets in — sadly, no trip south this year. 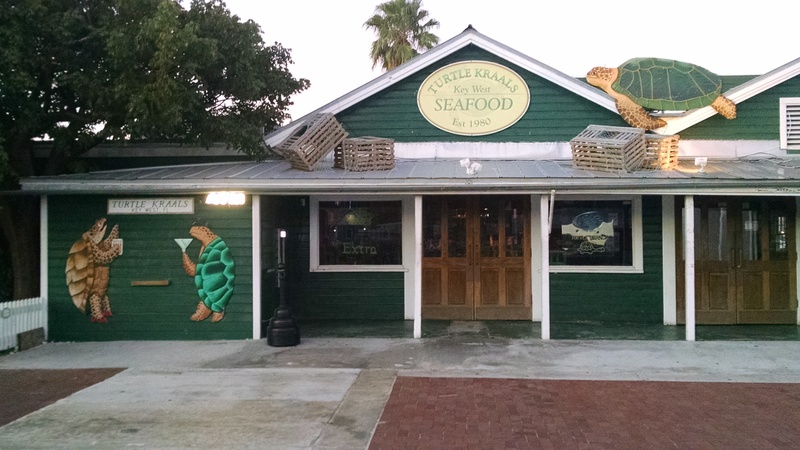 Stay tuned for the SSCA GAM, the SOS Chili cruise and other assorted adventures…….. Many, if not most, of us that sail and live significant parts of our lives on the water aren’t nearly as young as we think or feel. Reality bites, harder, each passing year despite our mental age. That should be more than enough motivation to encourage us to be training the next generation. Besides, spending time with grandkids, passing on the skills, and sharing with them our joy of sailing is just plain fun! So it is that I had another great weekend with Tyler – now 12 and fast becoming competent crew. It is always amazing to see how quickly kids learn, and how confident they become with new skills and experience. 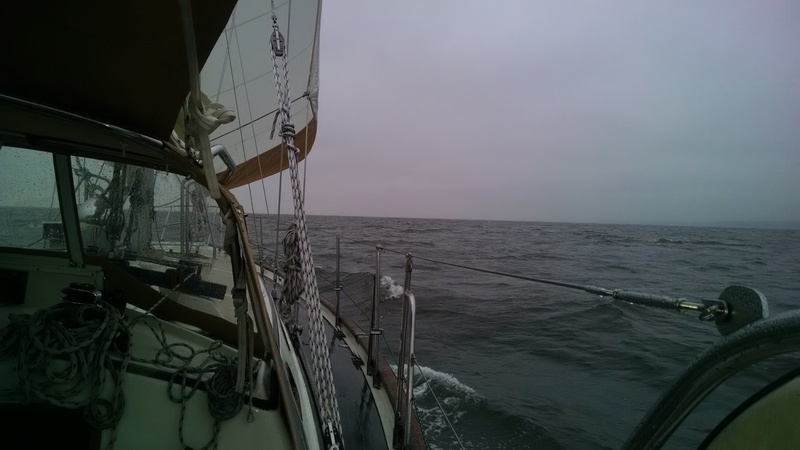 With near perfect weather, we sailed out of Back Creek (Annapolis) quartering down wind and across the Bay to St Michaels. It was great to enjoy the day and time on the water, but also the ideal time to give Tyler opportunities to practice skills that will become increasingly important as he is given more responsibility for driving and navigating the boat. There were two goals: one, for him to be able to safely manage the boat and return to port in the case of an emergency; the other, to instill the sense of joy and wonder that comes with following the wind to new destinations in our water world. No better place than here in the Bay. On this trip, he began his own sailing log. 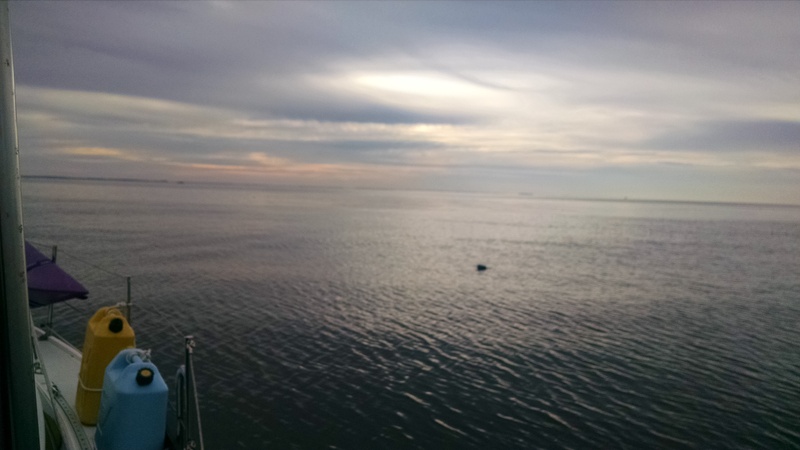 After preparing and provisioning Valinor for a three day cruise and reviewing the weather forecast, we left the slip on Back Creek at 0915. A short motor out of the creek, with a stop for fuel and pump out, sails up and trimmed put us on a broad reach heading down the Bay. We were looking forward to rafting with another Annapolis Sailing Club boat, ‘Pneumatos 2’, with a family of three similar aged kids. They got a later start out of South River, and we had anchor down just next to the Chesapeake Maritime Museum before they arrived. That gave time for Tyler to take the dink and explore the small cove – as well as fish. Kudos to the kind fisherman/crabber that gave Tyler a helping hand. After some unsuccessful fishing, I saw a fisherman across the way and suggested Tyler row over to ask what he was using for bait. Off he went and came back after a lengthy conversation, with some donated soft shell crab – a very kind gesture from a stranger to a kid! Later, a we made a brief tour of the museum and got a bite at the Crab & Claw making for a pleasant day.Impressed by the oil light that tops the Light house ..
Pneumatos 2 arrived, rafted up and the kids began to get acquainted – took maybe 5 mins? 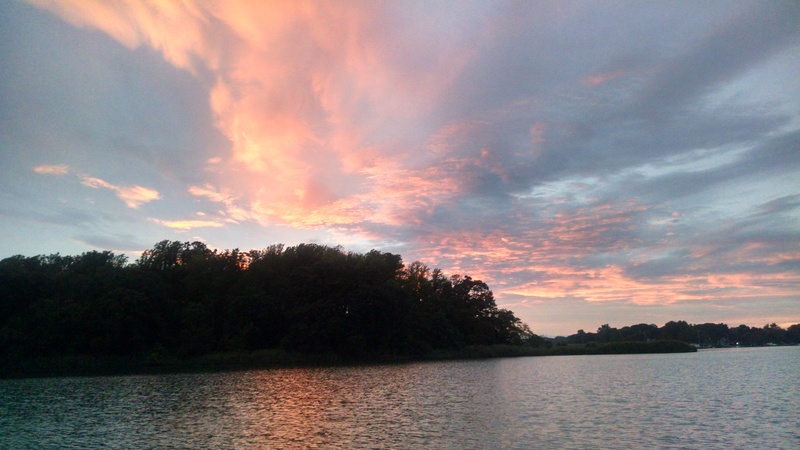 After a quiet night, we headed for the Rhode River. What a difference a few hours can make on the Bay. 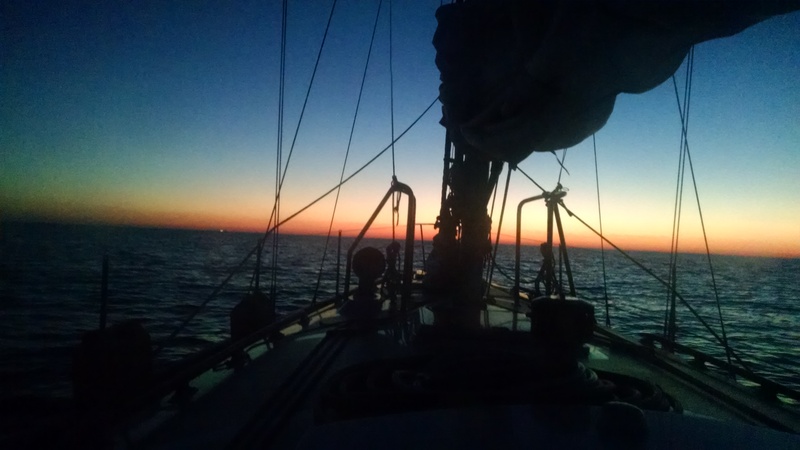 We made an early morning departure and found mostly light wind on the nose or none – managed only some motor sailing. 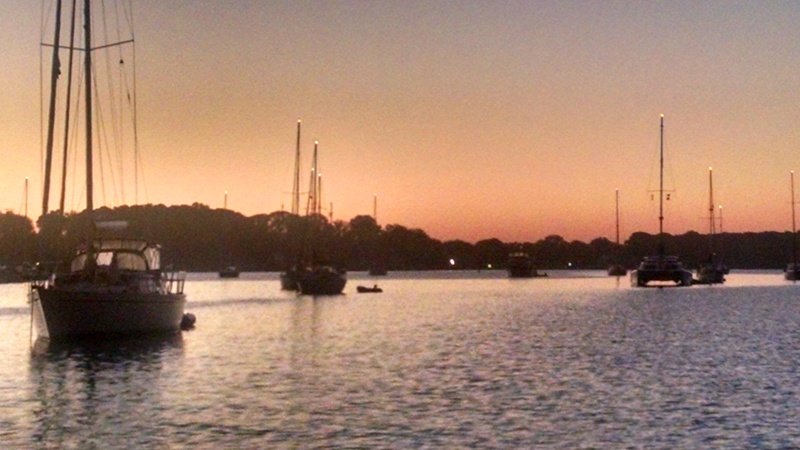 Our friends headed out later and had a nice, brisk sail across the Bay. Meanwhile, Tyler got his first lesson in operating the outboard…… a fast learner. It was another pleasant evening with good company, and dinner on the grill. The forecast was a bit problematic, and a quick look at radar about 4am had me up putting the sail cover on and closing hatches. A light shower passed through early morning, then cleared. 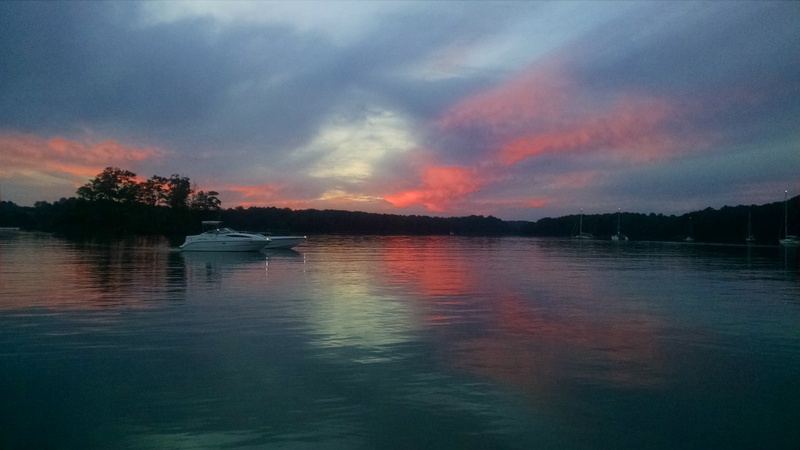 We said goodbye to our friends and sailed down the Rhode River in good wind – then headed north to home when winds died as we rounded Thomas Point – such is sailing on the Bay in the summer! In another week it’s back again across the Bay. This time past St Michaels to Shaw Bay with more ASC sailors! Almost forgot the log canoes.…we got a close up look at the St Michaels museum and then as one was towed past our raft, and again as we sailed out the river the next morning. Still hoping to get a ride before the racing season is over! The doldrums is a colloquial expression derived from historical maritime usage, in which it refers to those parts of the Atlantic Ocean and the Pacific Ocean affected by the Intertropical Convergence Zone, a low-pressure area around the equator where the prevailing winds are calm… …….. The doldrums are also noted for calm periods when the winds disappear altogether, trapping sail-powered boats for periods of days or weeks. The term appears to have arisen in the 18th century – when cross-Equator sailing voyages became more common. Colloquially, the “doldrums” are a state of inactivity, mild depression, listlessness or stagnation. And, a warm summer evening in the cockpit, anchored in a quiet and mostly empty lagoon, with your favorite beverage is hard to beat. Calms continue even in September. The last Hospice Cup race began and ended with boats drifting about aimlessly, and most crew in the water swimming to beat the heat. I’m hoping for a better day this year. With Sailstice behind us, beginning with the July 4th celebrations and cruise, I’m looking forward to as much summer sailing as I can find. 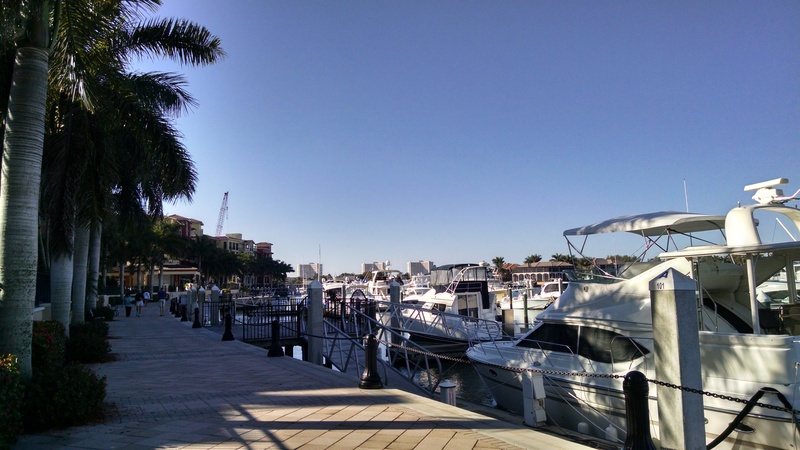 It’s already been a busy year beginning with the return from the Florida Keys in March/April. I’m well on my way to meeting the Spinsheet Century Challenge – 100 days on the water – with only about 10 days to go. Lots more club cruises on the calendar, as well as opportunities to grab for a day or so when the winds blow. For all my sailing friends, here’s hoping you find time and wind to enjoy! It was a long stretch spanning 6 months and about 4500 miles. South to Key West and home via the AICW was a great adventure. One gets accustomed to extended time managing the boat, and the daily routines. Adjusting to life off-boat has been a bit of a surprise. Now it’s periodic, short sails and the different patterns that come with being mostly anchored ashore. Not better or worse, just different. 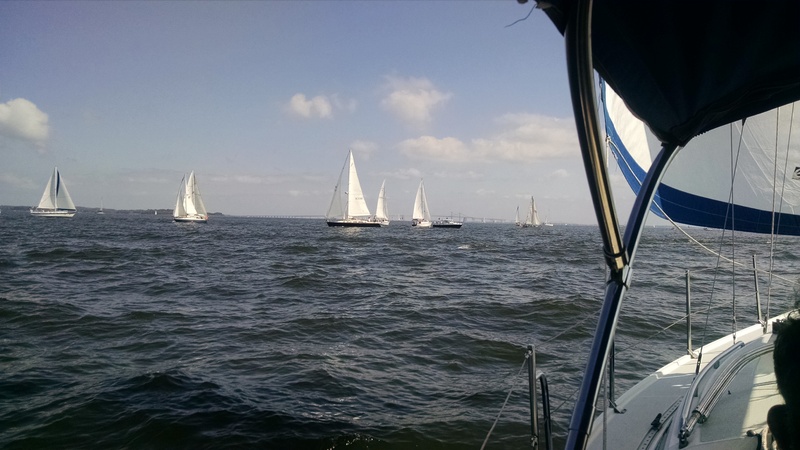 Early season sails with Annapolis Sailing Club, Singles on Sailboats and Chesapeake Catalina Yacht Club are offering good times on the water. 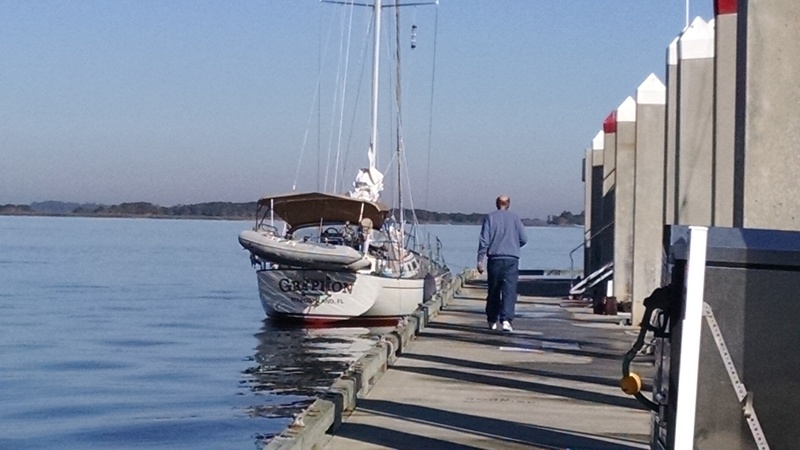 I stopped short of home on the trip back to meet up with SOS folks at Pirates Cove for their first season sail; took time out to work the Annapolis Boat Show for Passport Yacht; and managed a few day sails before hauling out to sand and paint the bottom mid-May. That was done just in time to be ready for the annual SOS cruise to the DNR camp on the Wye River. The next week I enjoyed a weekend sail with my bride. 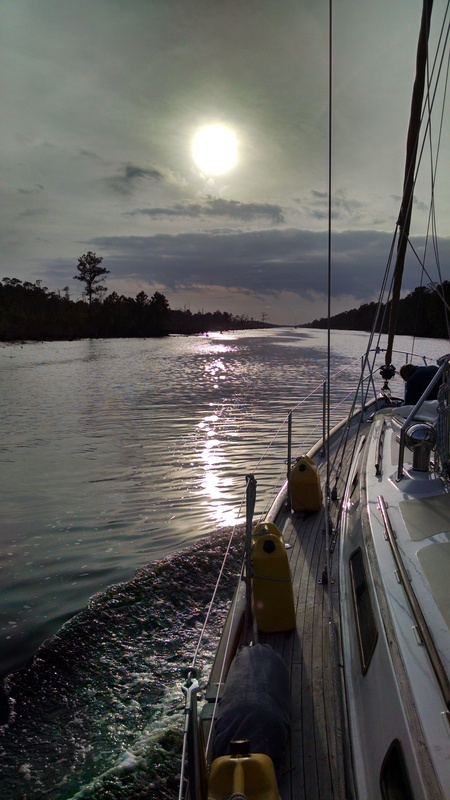 We had beautiful weather and a nice anchorage in the Rhode River. The end of May offered a short, but fun cruise and on-shore party with other ASC skippers and crew. 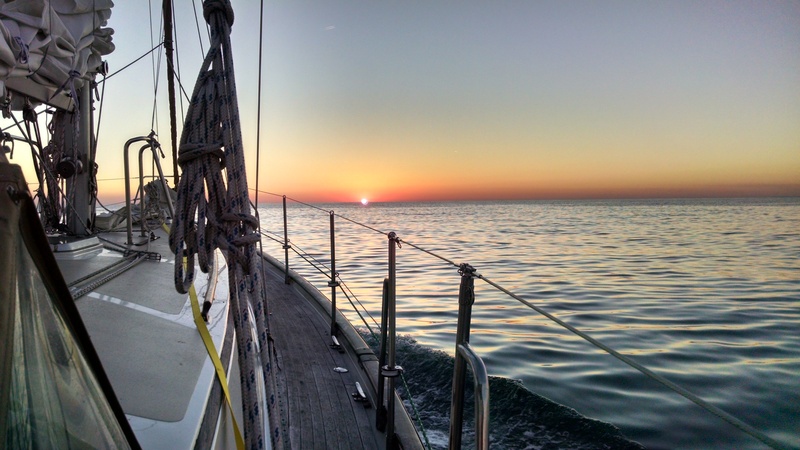 June will bring an extended sail with CCYC, and more great times on the water with sailing friends. Looking forward to exploring new places around the Chesapeake Bay, and making more friends along the way.